Well my birthday is winding down but I had a great day, starting with my mum calling this morning and ending with the little 4 inch birthday cake that I got for dessert. Sheldon and I were supposed to go to dinner but the poor baby came home early from work sick. So we rescheduled for Sat instead. 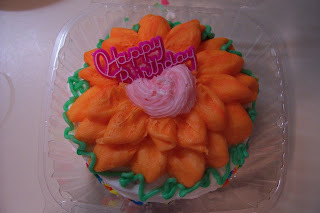 Went to the supermarket and got some lobster bisque instead and of course my little birthday cake. Thanks to all my family and friends for all their birthday wishes today. It meant the world to me. Next Post Crop Crop Crop!! That cake looks absolutely delightful! Did you eat it all in one sitting:)? I sure hope not (hahaha).